I've said it before, and I'll say it again: I'm not much of a Halloween person. Despite (or, perhaps, because of) this, I'm amused to no end to see that one of this blog's most popular posts of all time is Literary Halloween Costumes, which was posted in October of 2009. Because I aim to please, I decided to do a roundup of all of my literary-themed Halloween posts as well as some of my favorite ones from around the web. Enjoy! Literary Halloween Costumes (from 2009) - The original post came just a day before Halloween that year, so it focuses on costumes that you could probably throw together from things you have in your closet (Nancy Drew, Carrie, Oedipus Rex). More Literary Halloween Costumes: Children's Literature Edition (from 2010) features Scout from To Kill a Mockingbird, the titular Little Women, and The Cat in the Hat. Literary Halloween Party Ideas (also from 2010) - If I were to ever throw a Halloween party, odds are it would involve at least one of these themes (my favorite is the romance novel-themed party with the Harlequin Presents favors/conversation starters). Literary Halloween Costumes: Couples Edition (also from 2010 - I must have had an absurd amount of time back then...) has ideas for the bookish couple (romantic or platonic) pressed into going out on Halloween. Looking back at these suggestions, I realize that many of the couples suggested (Kathy and Heathcliff, the Phantom and Christine, Frankenstein and his Monster) are not exactly models of healthy relationships. On the other hand, they give functional couples a chance to act out in the name of being in character. Literary Halloween Costumes: Comic Strip Edition (from 2011) - How awesome would it be to go as Calvin and Hobbes? Literary Halloween Costumes: 2012 Edition (from 2012) - This list is a little shorter than my other ones (it was the first semester of my new job), but I still like the idea of someone going as Hans Christian Anderson's Snow Queen before Frozen took over pop culture. Literary Halloween Costumes: 2014 Edition (from 2014) - After a year off, the latest edition of literary Halloween costumes includes ideas ranging from Bridget Jones to Dorian Gray to Miss Frizzle. AbeBooks Literary Halloween Costumes has ideas including Pennywise (from It) to Pippi Longstocking. 21 Children's Book Characters Born to Be Halloween Costumes from Buzzfeed includes a lot of the usual suspects (Harry Potter, Madeline) mixed in with some more unusual ideas (a truffala tree from The Lorax). Mental Floss's 12 Wordplay Halloween Costumes - Not necessarily literary-themed, but people who love puns and clever costumes will be sure to appreciate these costumes! 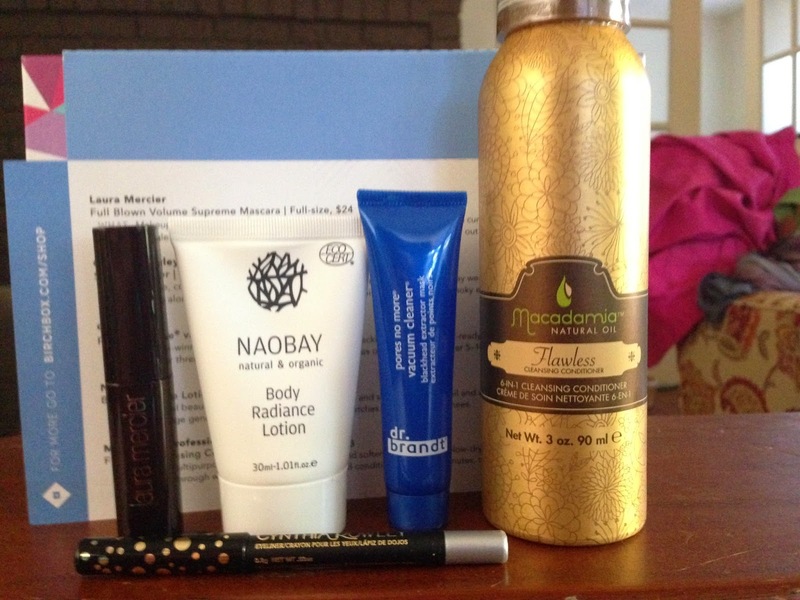 I'm very happy with the products included, and I LOVE the fact that there wasn't a foil packet or a perfume sample in the mix. I've tried the mascara, and it is fine. While I don't like it as much as some of the other mascaras I've tried, I appreciate having the chance to try it without having to buy the full size. I don't wear a lot of eyeliner, but the product will be perfect to put in my giveaway box. In terms of the products I haven't tried yet, I'm especially intrigued by the cleansing conditioner. I wash my hair everyday, and I'm hoping that the cleansing conditioner might be a viable every-other-day alternative to shampoo. If you got a September Birchbox, I'd love to hear about which box you picked and what you thought of your products in the comments below. While the weather was in the 80s and 90s last week, this week has brought distinctly cooler weather to the Midwest. Right now, it is in the low 50s, and fall is in the air. Because of this and because October will be here before we know it, I decided that this would be a good time to post another round of ideas for literary Halloween costumes (for more Halloween-related ideas, please see my previous posts). Miss Frizzle (from The Magic School Bus):I can't believe I haven't included Miss Frizzle on one of these lists yet, and it is past time for me to rectify the omission. As Pinterest has proven, there are many interpretations of the Miss Frizzle dress. For my money, however, I'd recommend a colorful shirtwaist dress with a full skirt and pictures related to elementary school subjects (think stars and planets, fruit, musical instruments and notes, or numbers). If you can't find a dress with a pattern or pictures you like, you can make your own or you can always decorate your own by using fabric paint or by attaching fabric cutouts. Be certain to wear loud, kooky jewelry (fun earrings, necklaces, and bracelets all work) and colorful, school-themed shoes. For extra authenticity, wear a short petticoat under your dress to help your skirt stand out, get a stuffed lizard to put on your shoulder (or get a friend to dress us as a lizard), carry around a small yellow school bus, and use Miss Frizzle's favorite catchphrase - "Take chances, make mistakes, get messy!" Dorian Gray (from The Picture of Dorian Gray): Given the nature of Dorian Gray's character, there are a number of different ways you could go with this costume. For instance, you could dress like a young Victorian gentleman and carry around a portrait of yourself that is older and more sinister. You could also do half of your face as young, innocent Dorian and the other half of your face as old, evil Dorian (the picture in question). Or, if there are two of you, one of you could be young, dapper Dorian and the other one could be old, sinister Dorian (complete the look of old Dorian by having the person wear a frame like this couple did). Whatever you do, go with men's evening wear (even a tuxedo would work - they were around in the 1890s). Peter Pan: The NBC musical event is coming in December, but you can be ahead of the curve by dressing as the boy who refuses to grow up. Depending on your resources (and how elaborate you want to go), you can make this as elaborate or as simple as you would like. The classic look is a green hat with a jaunty feather, a green tunic with rope belt, green tights, and green shoes, but you can make adjustments as needed. For instance, if the weather is chilly, feel free to forgo the tights and wear pants instead. A Beautiful Mess has some great pictures and suggestions for making your own tunic. If you have friends who also need costumes, they can dress up as the Lost Boys (think pajamas with a hodgepodge of accessories) or Tinkerbell (a sparkly short dress, wings, and a sassy attitude). Anne Shirley (from Anne of Green Gables and many, many other books): Anne Shirley (or Anne of Green Gables as she is fondly called by her legions of fans) is a distinctive character, but there is some flexibility when it comes to her clothing. Although most people likely envision Anne as Megan Follows from Kevin Sullivan films, Anne goes through a number of changes, so an Anne costume can be as simple or as elaborate as you (and your wallet) would like. If you want something simple, you can wear a long, plain dress with a pinafore, stockings, sensible shoes, and a plain straw hat, as Anne does when we are first introduced to her in the film and the book (red hair in tight pigtail braids is a must). However, you could also wear Anne's white organdy dress from her White Sands performance or her gown with puffed sleeves (if you want to be true to the book, the dress should be brown and in the Edwardian style, rather than the blue dress shown in the film) if you wanted something prettier. For some inspiration, the Sullivan Entertainment site has a page with four pictures of Anne at different points in the films. Bridget Jones (from Bridget Jones's Diary): Although the first Bridget Jones book came out 18(!?) years ago, she is still somewhat on people's minds because of a recent follow-up book. Consequently, now might be the perfect time to break out your bunny costume, hideous Laura Ashley dress, or ugly Christmas sweater and dress up as everyone's favorite (former) singleton for Halloween. One of the best things about Bridget is that she has a wide assortment of vices, so this could be a great excuse to smoke, drink, and/or indulge your sweet tooth (just don't make all of the questionable decisions Bridget does - it is one thing to pretend to be a character, it is another thing to emulate her in every way :). Just be certain to walk around with a diary all night (or, if you want to update it somewhat, take to Twitter the way Bridget does in Mad About the Boy) and record your stray observations, including calories consumed and cigarettes smoked. Bonus points for complaining about "smug marrieds." Many, many things of note happened while I was taking a break from the blogosphere, and one of the most interesting (at least to me in relation to this blog) was the strange creature that was Smash. When it was first announced, people were taken with its solid pedigree from both the film/tv (Stephen Spielberg! Anjelica Huston! Debra Messing!) and theatre (Marc Shaiman and Scott Wittman! Theresa Rebek! Megan Hilty!) worlds, and its premiere opened to a lot of fanfare and some solid reviews. However, almost from the beginning, the show was plagued with numerous problems in front and behind the cameras. A lot has been said about the rise and fall of Smash, including an intriguing behind-the-scenes look by Marc Shaiman, the insightful and delightfully dry review by The New Yorker’s Emily Nussbaum, and a series of recaps from The A.V. Club, the latter of which includes the wonderfully snarky (and accurate) summation of the series as a “long parade of talented people and Katharine McPhee realizing the show with such promise they signed on for has become… this.” Given all of this and the fact that the show lasted a mere 32 episodes, it seems like everything that needs to be said about Smash has been said. However, thanks to the magic of YouTube and its “Watch It Again” section, I found myself revisiting some of Smash’s highlights and lowlights, which got me to thinking about the show as a whole. One of the issues with Smash is that it often garnered the wrong kind of attention, especially near the end of its brief tenure. After a thrilling pilot, which culminated with Ivy (Megan Hilty) and Karen (McPhee) vocally duking it out with the rousing “Let Me Be Your Star,” the show made a series of missteps that alienated its natural fanbase (theatre people). The characters lacked subtlety and consistency, deus ex machina seemed to happen every week (Grace Gummer comes to help her mother [Anjelica Houston] see the error of her ways before going off to count trout or salmon or something), and even the most basic plot points and details seemed ridiculous. By the show’s end, the small audience that remained mostly consisted of hate-watchers who wanted to comment on Karen’s awfulness or Julia’s (Messing) questionable scarf choices and annoying son. In all honesty, reading the recaps and forums at places like the departed Television without Pity were much more entertaining and lively than anything depicted in the Smashverse. However, thinking about the show and watching clips a year after it ended has been an enjoyable experience. Yes, the show is still deeply flawed, and yes, Karen/McPhee continues to be its weakest link, a distinction that is impressive since the show had so many problems. However, minus the animus and the derisive, if often deserved, commentary surrounding the show in its death throes, Smash is indeed entertaining in a non-ironic way. There are some very good performances that transcend the terrible character development; Hilty, Messing, Jack Davenport, Houston, and even Jeremy Jordan, who was saddled with a character that seemed custom-made to be awful, did the best they could with what they were given. Hilty, by far, was the highlight of the show, and she was able to give Ivy dignity despite the character’s whiplash-inducing turns. The other aspect of the show that truly stood out to me upon rewatching the clips was the musical numbers. There were some stinkers, to be sure (I had a very hard time connecting to Hit List, a show whose dislikable characters rival the ones found in Smash), but many of the songs are quite good. Shaiman and Wittman’s contributions, including the Bombshell songs and the wonderfully campy “A Thousand and One Nights” (ignore McPhee's contributions and concentrate on Raza Jaffrey and the rest of the cast), stand out. The second season brought some stellar numbers from Andrew McMahon, Joe Iconis, and Pasek and Paul. Even when the show’s plot was cause for secondhand embarrassment, the musical numbers, for the most part, were interesting and sometimes even excellent. McPhee’s acting chops are decidedly not up to the job of transforming Karen from a passive-aggressive Mary Sue to an actually likable character, but that isn’t the only problem at work. Despite Smash’s attempts to tell us that Karen is the most awesome, most special, most talented actress ever to appear on the Great White Way, McPhee doesn’t have the incandescent sparkle needed to match the rapturous praise her character receives in heaps. She also suffers by comparison to Hilty and the head-to-head competition between Karen and Ivy that is dictated by the script. In most cases, Hilty wins hands down. However, this isn’t to say that McPhee is untalented; there are moments where she did an okay job with Marilyn (please don’t throw things at me), and numbers like “Public Relations” show moments of the sparkle that the other characters constantly attribute to Karen. Unfortunately, this small glimmers do not an entire character make. Yes, this is a little too "Up with People," especially since the song is about suicide, but I enjoy this version of song a great deal. If only the rest of Hit List were as raw and energetic as this. It was a toss-up between "Let's Be Bad" and "The National Pastime" for this slot, but Hilty has so much great subtext in this number that it wins.